This guide shows by example how to setup Phaser.io and get started with PlayFab within Phaser.io. To serve HTML pages to your browser you will need a web server, we use MAMP / MAMP Pro, but you can use anything you are comfortable with. You can alternately read our Local Node HTTP-Server Guide. Download Phaser min.js and save it to your /js folder in the website root. You should get a blank page with "Hello World!" on the page. You should now be seeing the following image, and your Phaser.io installation is completed. 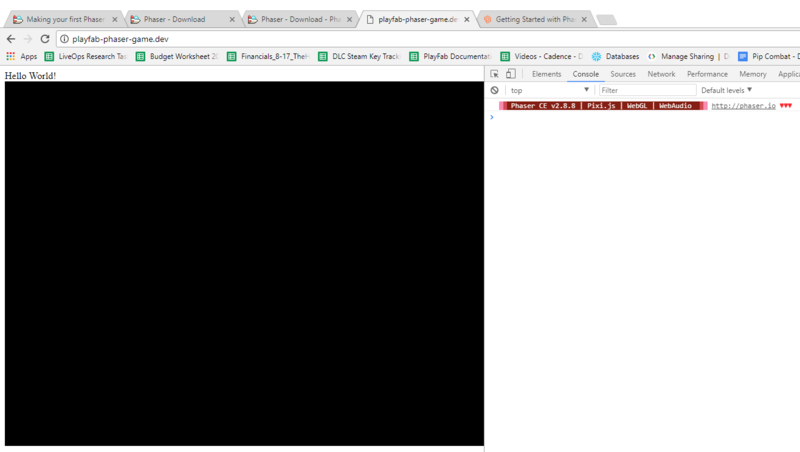 As you can see phaser.io has initialized a canvas and it is blank. Add the script tag to load PlayFab just after the loading Phaser. game.PlayFab.settings.titleId = "D6EC"; //Your title Id from playfab goes here.